When I return home after a day’s work, I am often looking for a quick, easy meal for supper. 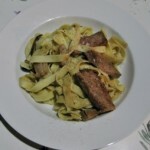 One of my favorite dishes is tagliatelle with a sauce. As an elderly Italian client said to me recently all you need is good ingredients for the sauce, it does not have to be a complicated recipe. So here is one of my easy recipes, (you can add cream to the mushrooms if you want a richer sauce). The porcini mushrooms are readily available and I buy fresh tagliatelle which I deep freeze. In this recipe I used slices of sirloin steak but you could also use fillet steak. It is the topping of white truffle butter that creates a delicious aroma and makes this dish special. Coarsely chop the mushrooms into small chunks. Melt half the ordinary butter in a heavy based frying pan and cook the garlic and mushrooms. If you wish to add cream to the sauce then after the mushrooms have cooked, turn down the heat and add the cream, Simmer gently and stir, do not allow to boil. Put a large pan of water with some salt on to boil. Add the tagliatelle and cook for 4 minutes until nearly soft. Cover tagliatelle with the mushrooms and mix in. Heat up the rest of the ordinary butter in a heavy based frying pan and quickly fry the steak slices. 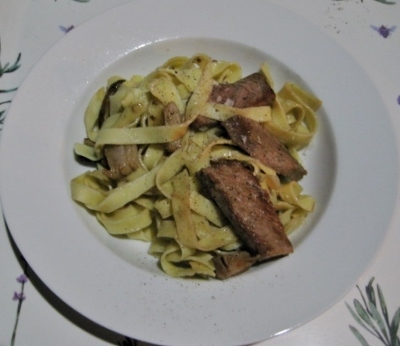 Place the steak slices over the pasta and pour over any remaining melted butter. Add a few small teaspoons of white truffle butter to the top of the steak and serve immediately.